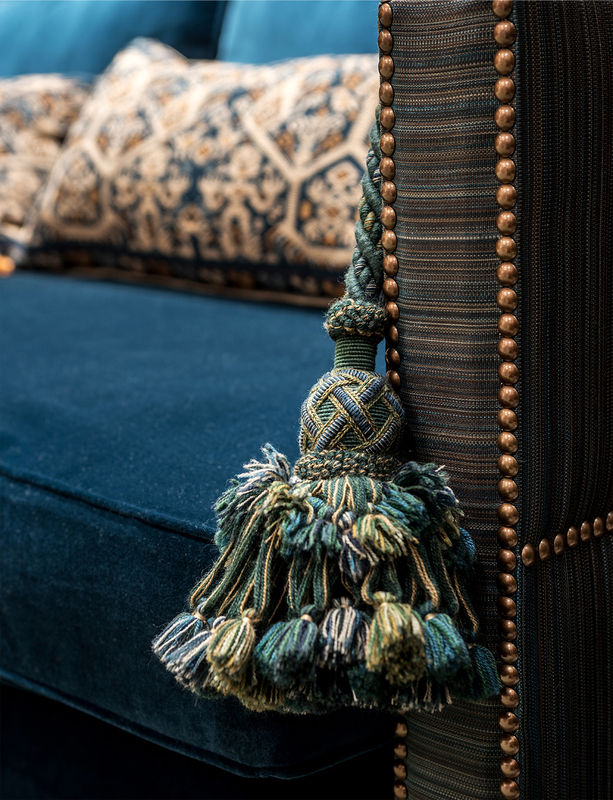 Whilst some of our clients seek nothing more than crisp piping, others cannot get enough of tassels and trims. This newsletter is written in their honour – thank you for allowing us to be indulgent! Picking up the British sunshine in this south facing bay window with shades of gold, spring green and that elusive bright sky blue. 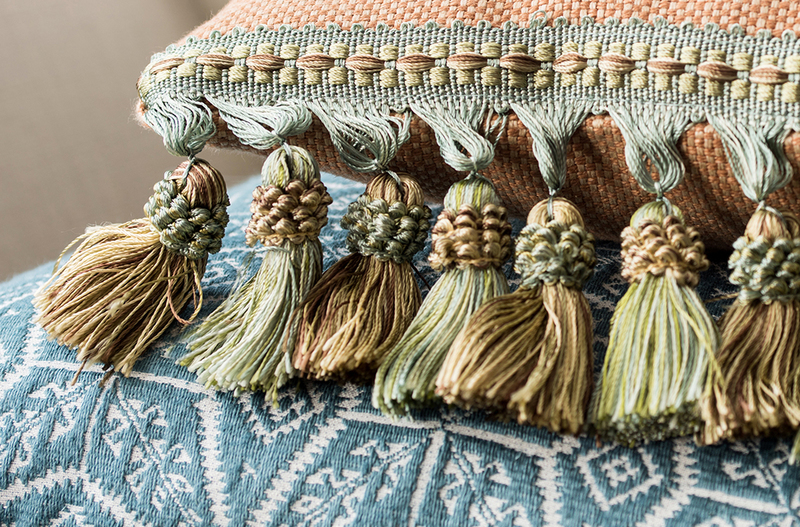 See how this plain linen from Holland & Sherry is elevated by the Kravet tasselled fringe. Both sit with pride on Soane’s irresistible Kaleidoscope fabric. This close-up is part of our contemporary take on a Knowle sofa. In fact, it is a sofa bed. 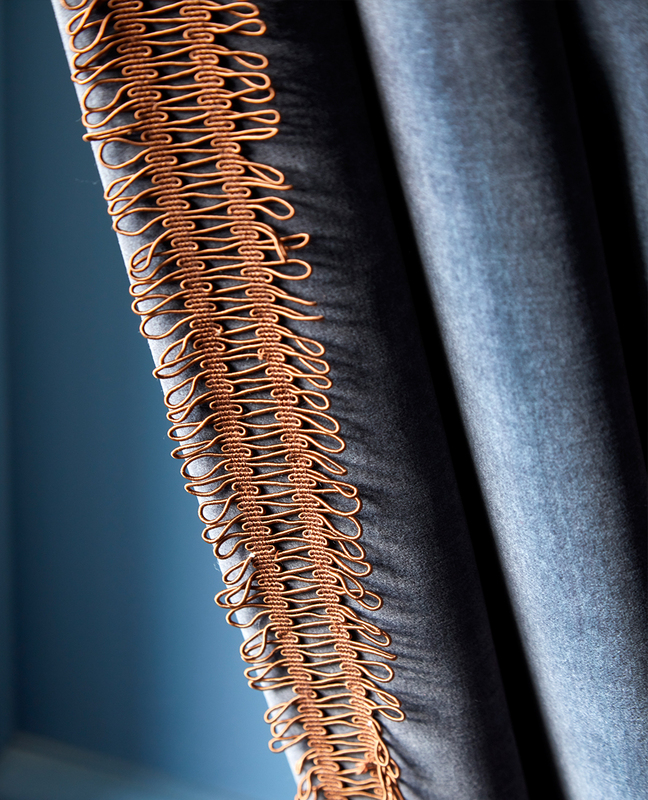 We like the oxymoron of John Boyd’s horsehair textile and the soft richness of GP & J Baker’s sumptuous Kelway velvet. The Claremont tassel brings together all the colours in this morning room. Hung in a Georgian dining room, these curtains look out over formal gardens. It’s slightly decadent to have the Robert Allen vintage chintz on the reverse looking out over an abundance of old English roses, with simple Pierre Frey Fadini Borghi slubbed silk facing in. 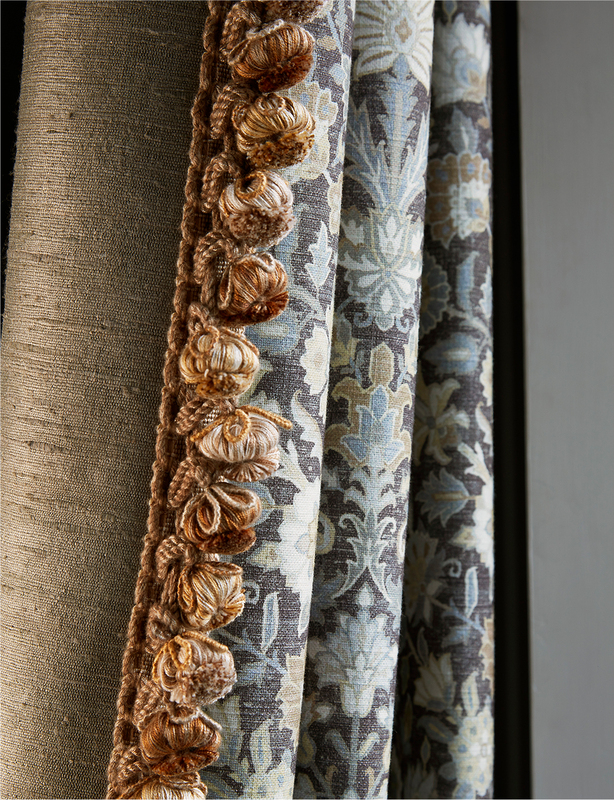 Of course, the playful Rousseau pom-pom fringe from Samuel and Sons completes the picture. 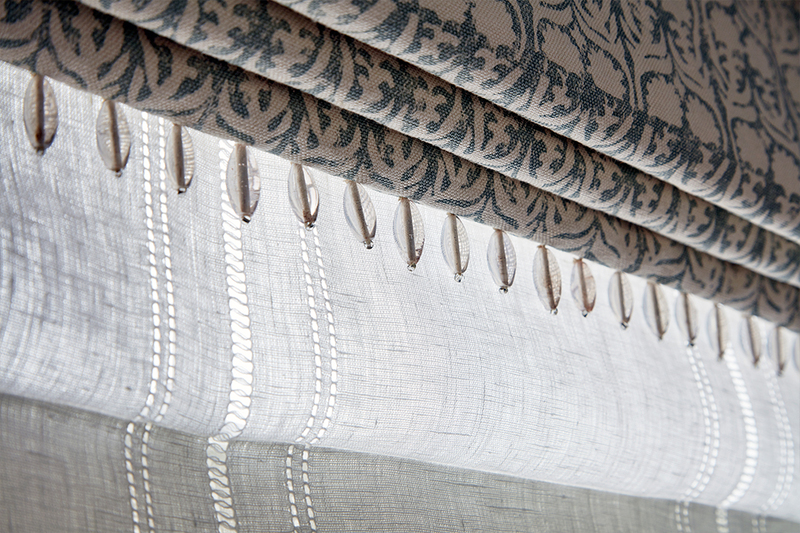 Gathered in pleats this Roman blind allows the light to flood into this master bathroom. With the added trim of opalescent Lumiere glass beads from Samuel and Sons this bathroom shimmers. A rich set of velvet curtains from George Spencer hang proudly in an Oxfordshire Library. Whilst the curtains blend tonally with the painted joinery, the bronzebraid trim from Jessica Light subtly catches the evening light, adding lustre and elegance to this newly commissioned library. Pairing cushions is such fun. See how this lime green geometric fabric – Zaire by Vero – brings a vibrant and contemporary twist as it is combined with the much softer, blended silk and linen fabric shown here in ‘Berry’ by Michael S Smith. 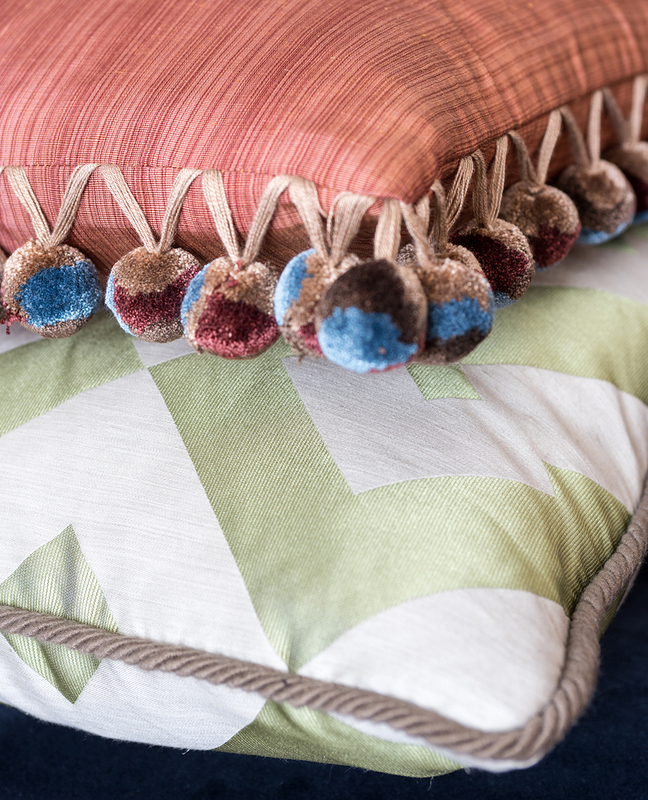 We believe it is both the geometric stitching and the pom-poms in the Kravet fringe that unite this couple so successfully. 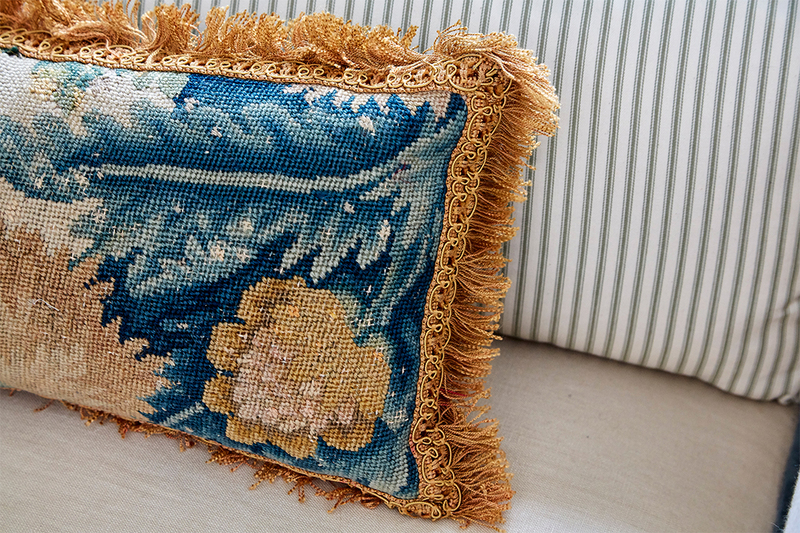 This fragment of antique needlework was sourced in a small out of the way atelier brimming with historic textiles. We finished the cushion with rich golden fringing and paired it with Roger Oates’ simple cotton ticking. Both adorn a bespoke designed contemporary chaise longue in our client’s Georgian home. Surely the most indulgent bullion fringe we have ever used – Declercq’s Moulinee Meches. The new puppy loves it!